Update on QB David Ash: Head Athletic Trainer for Football Kenny Boyd confirmed Ash is clear for offseason training. Ash is anticipated to be available for full participation in spring practices. Ash has been out due to concussion symptoms since September 21 against Kansas State. He and freshman Tyrone Swoopes are the only two scholarship QBs Texas has so getting Ash back is huge news. Obviously it’s also great news for Ash as he can finally get back playing football. Hopefully for the sake of his career and his life after football he can stay healthy from here on out. Love listening to Coach Strong doing the Q&A sessions. His passion and football IQ are clear and contagious. Kids are going to love playing for this guy. See an overview on the new coaches here if you want to find out who these guys are. Being reported by multiple sites but not confirmed yet, but it appears that Mississippi State offensive coordinator/quarterbacks coach Les Koenning will be the next wide receivers coach for the Longhorns. Koenning’s hire would confirm that former WR coach Darrell Wyatt will not be returning. Koenning played at Texas as a wide receiver from 1977-1980 and started his coaching career with the Longhorns in 1981. Prior to being at Mississippi State, he was the offensive coordinator at Texas A&M under head coach Dennis Franchione from 2003-2007. In the conversation as the best offensive line coach in college football, Wickline is a guy Mack Brown tried to lure away from Oklahoma State a few years ago but Strong got the job done. Someone Texas fans will love to watch coach on the Longhorn Network, Wickline could mean we finally see a Texas offensive line capable of imposing their will in the trenches. At his introductory press conference Strong confirmed that Wickline would be the team’s offensive coordinator and call plays, something he has not done in the past. A lot of consternation from Longhorn fans when Watson was thought to be the next OC but at the team meeting he was introduced as only the team’s quarterbacks coach. Watson was most recently the offensive coordinator at Louisville with Strong after stints at Colorado and Nebraska. The USC running backs coach is a big hire. Robinson has NFL and college experience and also has a lot of experience in Texas as he spent time at TCU, Oklahoma State, and with the Dallas Cowboys. Mississippi State OC/QB coach who played at Texas as a wide receiver from 1977-1980. Has done stints as an wide receivers coach, QB coach, and offensive coordinator at Texas, TCU, Alabama, Houston, Rice, and in the NFL. Prior to being at Mississippi State, he was the offensive coordinator at Texas A&M under head coach Dennis Franchione from 2003-2007. A Texas coach since Mack Brown’s first season, Chambers will be on the Texas staff in some fashion. It was originally believed that he would stay on as tight ends coach but recent rumors are that Chambers’ role may transition to recruiting only. A two-time All-Southwest Conference player as Texas defensive back, Bedford is coming home after nearly 30 years as a coach. Bedford was at Florida and Louisville with Strong and will be a “walk around” defensive coordinator and will not be responsible for a specific position. Rumph was hired away from Nick Saban’s staff at Alabama where he coached for the last 3 seasons including 2 national titles. Like all of Coach Strong’s new staff, a great recruiter who should be able to assemble and coach up some great defensive talent. Jean-Mary coached linebackers and was recruiting coordinator and assistant head coach at Louisville under Strong. Jean-Mary, who was a finalist for 2013 Linebackers Coach of the Year award, was previously at Georgia Tech and North Alabama. Vaughn comes from Memphis where he coached cornerbacks. He previously served on Houston Nutt’s staffs at Arkansas and Ole Miss. Vaughn will also reportedly be in charge of the Texas special teams units. Maybe the most exciting change, Moorer has a great reputation and appears to be a coach who will be able to change Texas players’ attitudes in the weight room and on the field. Even injured players have to keep working in “The Pit” until they’re ready to get back on the field. Definitely an impressive staff assembled with recruiting in mind. The biggest question marks are offensive coordinator and in the secondary with Texas legend Duane Akina departing. But if Wickline and Rumph can remake the trenches on both sides of the ball we’ll start to see a difference pretty quickly. Stay tuned for updates as the last couple of spots are filled and things are made official. Added Les Koenning as WR coach. (1/15 8:44am)ficial. New Texas head coach Charlie Strong had his first press conference today where he was introduced to Texas fans by school president Bill Powers and AD Steve Patterson. Coach Strong spoke for a bit about Texas tradition, his time at Louisville, and his plans for getting Texas Football back on track. Really enjoyed listening to him speak about football and his philosophy on building a program. Funny and genuine. Said all the right things and sounded like he meant them. Also great to see his respect for Darrell Royal in there too. Based off his jokes at the expense of the recruiting sites, I’m guessing that a lot of the people claiming he isn’t good with media are media members he didn’t glad hand enough. Despite some Internet blathering, he appeared to be a guy who will be as good with the media and big money donors as he wants to be. Isn’t it awesome to be excited about Texas Football again? Welcome to the Forty Acres Coach Strong. Both Orangebloods.com and Horns247 are reporting that Charlie Strong will be the next Texas head coach. Before being the Louisville head coach, Strong was an assistant at Notre Dame, South Carolina, and Florida. 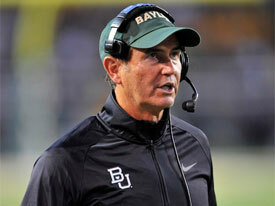 Concerns about Art Briles: Is Baylor good, or is the Big 12 bad? There are pros and cons to every potential next head coach. Yes even the great Nick Saban. Not enough experience. Too old. No big wins. Doesn’t know Texas. Can’t recruit. Coach Art Briles has won big at Baylor. Can he put the Longhorns back on top? My concern about Art Briles is more complicated than that. He certainly has experience. He’s taken Baylor to unimaginable heights both on the field and in recruiting. He’s respected by Texas high school coaches. The big question is, how good is Baylor really? Their resurgence has coincided with a time when both Texas and Oklahoma are as bad as they’ve been in 15 years. Texas Tech is just ok. The Husker and Aggies are gone. The Big 12 was incredibly strong just 5 years ago, but now the conference is just a shell of it’s former self. How high would people be on Briles if he has 2-3 more losses each of the last 3 seasons? Yes Baylor is leaps and bounds better than they’ve ever been before and Briles deserves all the credit for that but I’m not sure that’s any more impressive than what Charlie Strong has done at Louisville or James Franklin at Vanderbilt. And Strong and Franklin are probably last on the Texas fan base’s wishlist. I’m high on Briles and would be excited if he was hired by Texas, but he’s 58 and his defenses have ranged from ok to awful. He’s not the slam dunk that many Texas fans think he is. But hey, Briles might not work out at Texas but at least the offense should be fun to watch. What a difference 30 minutes make in one’s life. How many times have we heard the comment “Give me 30 Minutes and…”? In 30 minutes you could get a pizza back in the day. Sitcoms were supposed to make you laugh in that amount of time. Your girlfriend or wife has said at least once in their life, give me 30 minutes and I will be ready to go. It takes at least that much time to go from Cowboy Stadium to the American Airlines Center in Dallas (minus traffic). There are countless workout videos that promise a fitter you in that amount of time. 30 minutes in a football game is one half of the game. Stop with the analysis that a half of football usually takes an hour and half to complete. Work with me here. Two 15 minute quarters offered the fate of the 2013 Longhorn football season. The start of the football season with a 1-2 record saw the fan base throw up their hands and say enough is enough. Mediocrity is not something that the fans like served season after season after posting a 30-20 record over the past 4 seasons. Something changed the dynamic of the 2013 season when the Horns went to Dallas and whipped up on OU. The season looked salvageable with a Big XII title in the mix. Another slip up at home (12-10 record at home during the same four year stretch) against Oklahoma State caused fans to reflect on the season while Coach Brown focused on one game at a time. Fans look at every loss and over analyzed while coaches and players need to be focused on the task at hand. Horns fans even had to reassess their loyalty after cheering for the hated Sooners to come through earlier in the day. That is why even on the final day of the regular season the Longhorns had a chance to claim the Big XII outright with 30 minutes left. Tied 3-3 at halftime in Waco with all the “Case Closed” shirts donned by Baylor fans hoping for their own Brazos Miracle. The Horns were hoping to win the game while the Bears expected to win the game. Amazingly those 30 minutes could have resulted in a birth in the Fiesta Bowl, a Big XII Championship and surely a 10 win season. Thirty minutes would have erased a roller coaster season and solidified Mack’s determination to right the ship. Heck 30 minutes would have yielded a sign shop order to put ’13 on the upper deck of DKR. Thirty minutes would have earned Mack another $5 million dollars for the 2014 season, because no one is going to fire a BCS bound coach. WTH?! (What the Heck?) moments are attempts to find the memorable and the off-beat perspective on Longhorns sports. Here are some interesting moments from Texas’ matchup with Oklahoma State. Pregame WTH Fans?! Where was the crowd? There were a lot of empty seats even though the announced crowd was 99,739. I guess #TurnUpDKR did not have much effect. 2nd Quarter (11:02) WTH Daje?! It’s the second straight game where Daje Johnson has a brain freeze while trying to field a punt. The rule is DO NOT field a punt inside the 10 yard line. Love the speed, not the decision making. Halftime WTH Band?! Shout out to all of our veterans on this special day. Great job by the UT band reenacting the flag plant at Iwo Jima. Halftime WTH Major?! I saw Major Applewhite running from the locker room with security in tow with 5 minutes still left in the halftime. It’s amazing that our OC has only about 15 minutes to offer any halftime adjustments. 3rd Quarter (5:30) WTH Royal?! The scoreboard shows one of Darrell Royal’s favorite saying that when you throw three things happen and two of them are bad. Wish Major Applewhite would have read the screen before the start of the game. The Texas team needs help from wherever it can get it. 3rd Quarter (2:30) WTH Delay?! The Godzillatron shows a taped delay view of our troops in Afghanistan showing their frustration on a previous UT play. Just two plays later Case McCoy doesn’t see the linebacker and throws another interception. 3rd Quarter (:42) WTH Horseshoe?! This has happened way too many times. The shine is officially coming off the Horseshoe. Case McCoy sky balls a throw for his third interception of the night. 4th Quarter (15:00) WTH Fan Services?! 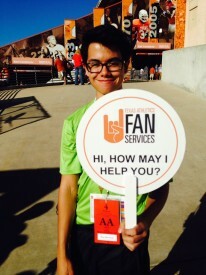 I see the signs around the stadium “Need Help?” text “TXFAN” with issue and location to 69050. I even found this kid with a sign “How may I help you.” No one could offer any assistance on getting any points on the board for the Horns in the second half. The team ends up suffering the worst home loss in the Mack Brown’s tenure. Next up for the Longhorns are the Red Raiders from Lubbock on November 28th in Austin.